then offered two separate apologies. As the Interim Moderator of Metropolitan Community Churches, I recognize these words guised in a sermon and the apologies. So many of us know the spiritual abuse heaped upon LGBT persons, the ways that our lives are diminished and shamed both publicly and privately. Kim Burrell’s words calling God’s beloved children perverts who are going to die does not reflect the gospel of Jesus, or the good news of life and liberation we celebrate in MCC. 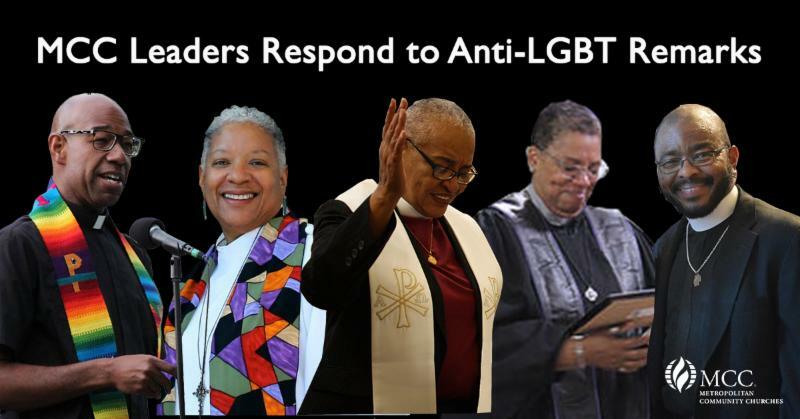 Today, we stand in solidarity as MCC Clergy and Laity affirming our values of inclusion, community, spiritual transformation, and social action in an open response to Kim Burrell’s homophobia. Below are words of freedom, hope, and healing from Rev. 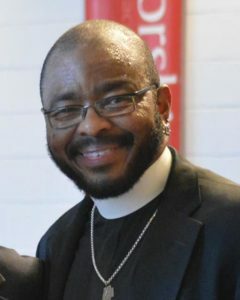 DeWayne Davis, Rev. 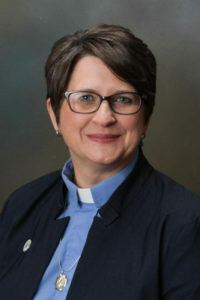 Wanda Floyd, Rev. Candy Holmes, Rev. 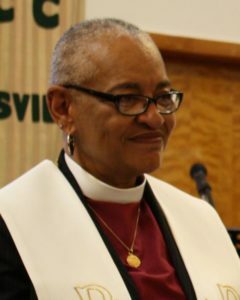 Elder Darlene Garner, and Rev. Brendan Boone. Please read and share with widely with others. As the descendants of slaves and the children of a generation who fought Jim Crow discrimination and segregation, we know all too well how the sacred text can be twisted and misinterpreted to perpetuate abusive and violent theological systems of control. We know how often faith and religion have been used to shame and blame those on the margins so that the power and privileges of the majority can go unchanged and unreformed. Kim Burrell is but the most recent purveyor of this kind of spiritual malpractice disguised as “speaking truth in love” or “loving the sinner and hating the sin.” She appears to have stopped listening to the promptings of the Holy Spirit to bring good news and instead chosen the path of demeaning and denigrating those who have already been beaten up by hateful and soul-crushing theology. But we know such violence cannot long stand in light of the sovereign grace of God and the liberating gospel of Jesus Christ. And so we assume the prophetic mantle everyday to bear witness to a gospel of love, liberation, and inclusion that does not prophesy death and destruction on our neighbor. We open our lives and our ministries to a larger truth that we are all God’s children, loved by and beloved of God, called to affirm and celebrate the lives of God’s same-gender loving and gender nonconforming children as a divine and intentional gift of God. We know that our words have the power to wound and kill, so we reject abusive religious language to speak life to so many who have been harmed, attacked, and disowned by far too many preachers, churches, and communities who speak death and destruction in the name of God. Now more than ever it is time to let go of this kind of abusive and violent religious language so that we can build beloved community that seeks the common good for all. We invite Kim Burrell to begin a dialogue on how to affirm all of God’s good creation and put love into action. “I grew up listening to Gospel artists and the messages of hope that they shared. In many ways those messages saved my life. But the sermon and non-apology from gospel artist Kim Burrell exposes what has been and continues to be the case, that she and others like her can wrongly use religion to be hate-filled, harmful, and spiritually abusive. 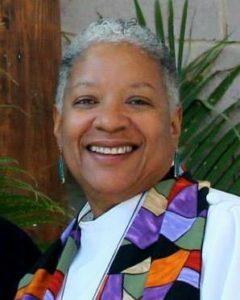 I am a witness as a Lesbian who is African American, Christian with Baptist and Pentecostal roots, can proudly say with conviction that nothing can separate me or any LGBT person from the love of God. I pray for and encourage every LGBT person who hears Kim Burrell’s shameful words (and any other sermon or music) to stand in the reassurance that you are beloved. Everything God made is good. Including YOU! Kim Burrell’s feeble attempt to apologize was a misguided and hurtful as her original hate-filled statement. Love and hate cannot occupy the same space. Her hatred of LGBT people is still apparent, even though she tried to excuse it away. She says that we are to “love the sinner but hate the sin,” implying that it is scriptural mandate. The truth is that those words cannot be found anywhere in the Bible. As a gospel singer and preacher, I understand her need to share what she believes is her interpretation of the Bible. We all do as clergy. However, when you begin to spew it out in the way she did without regard to what she was saying or “trying” to say, I do not believe it is of God. I am disappointed she would use her reputation to damage so many people, especially young African Americans who look up to her and struggling with their sexuality. It saddens me, as far as we have come as a society, there are still many people who use their voice to condemn and judge others. “In the attempt to find words to describe the sense of shock, disappointment and hurt I experienced listening to Burrell’s rant and subsequent less than authentic, superficial apology, I have been more than unsuccessful. 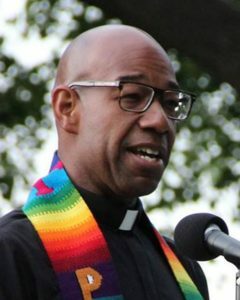 As a Christ follower, a child of the Black Baptist church tradition, an educated, ordained clergy person and a transgender male, my soul weeps for those who sat through, listened in on or have listened to the soundbite of her “sermon” and rushed attempted to appease long-term followers (many of whom are LGBT) by offering an apology on social media that was anything other than any apology. Those of us who are called and assume the mantle of being “under shepherds” for Christ with and among Christ’s people, are called to be “wounded healers” with and among an already marginalized, alienated, battered, abused, dismissed and devalued people. As people of African-American religious experiences, we know this reality all too well. Sadly, the sweet taste of power and privilege, even for African-American preachers, in addition to the quest to “one up” or “out preach” someone else (particularly with the spread of social media and “live” casting), more often than not, subjects the speaker’s listeners to toxic religious rants and rhetoric that have no roots or foundation in the message of Jesus. If you are struggling with your orientation or gender identity know that there is a community of faith here to walk with you, support and love you. Find an MCC church near you at the link below and step into new life in 2017!